Free shipping. Buy direct from HP. 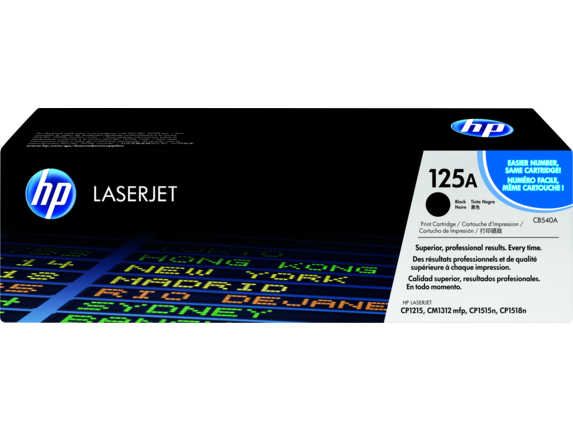 See customer reviews and comparisons for the HP 125A Black Original LaserJet Toner Cartridge, CB540A. Upgrades and savings on select products. 1 Program features and availability may vary by country. For more information, visit http://www.hp.com/learn/suresupply. Order consolidation available on printers with HP Easy Printer Care Software installed. 2 Based on comparison of HP Color LaserJet CP1515n/CP1518ni and HP Color LaserJet CP1215 to the HP LaserJet P1505 Printer series; and the HP Color LaserJet CM 1312MFP to the HP LaserJet M1522MFP and HP LaserJet M1120MFP. Assuming customer is printing at least 30% of total pages in color with content similar to the color ISO/IEC 19798 test suite (http://www.iso.org/jtc1/sc28) and overall average job length of three pages. Yields established using ISO/IEC test standards. Actual yields and costs vary considerably depending on images printed, number of color pages printed and other factors. 3 Program availability varies. HP printing supplies return and recycling is currently available in more than 45 countries, territories, and regions in Asia, Europe, and North and South America through the HP Planet Partners program. 4 Declared yield value in accordance with ISO/IEC 19798.